The primary cause of this $5 billion sinkhole is the lack of regulations for correctly packing a container. Packing guidelines exist, of course, but without regulations there is no way to enforce them. This is not the case for packing dangerous goods. 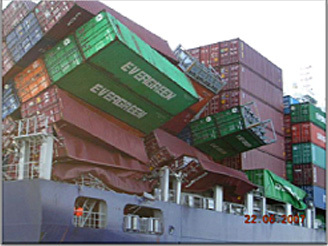 Chapter 7.4 of the International Maritime Dangerous Good (IMDG) Code specifies the mandatory dos and don’ts under the IMO/ILO/UNECE Guidelines for the Packing of Cargo Transport Units. Common terms such as blocking and bracing are used in the general packing guidelines, but there are many other important details that must be considered. Properly packing a shipping container is as much an art as a science. Yes, science. Learn how to file your export shipments through AES. Once a container—also known as a cargo transport unit or CTU—is loaded, a shipper often thinks that all is well and considers a CTU as somewhat invincible. That is far from the truth. These containers are built rugged for a reason. Their average lifespan is approximately 20 long, harsh years, and they experience a variety of extreme climatic and physical stresses before they are scrapped. When packing a CTU, it’s a popular misconception that heavy items have less chance of moving than light items. Think about what happens in a car when you slam on your brakes. Hopefully you’re wearing a seatbelt. Otherwise it doesn’t matter how much you weigh; you’re going to smash your head against the dash or the steering wheel. What about the truck driver who has to do the same thing? Will the freight he’s hauling in a container be secure? This is called longitudinal stress. The force of gravity and inertia are the main culprits. Now consider the physical stresses on board an ocean vessel. While longitudinal stress is still a factor, it’s compounded by lateral stress caused by the motion of the ship. 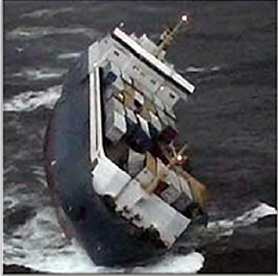 A ship can roll as much as 30-degrees either side of vertical. Here’s the science bit. Imagine you’ve double-stacked steel drums on the left side of the container and corrugated fiberboard boxes on the right. Everything was loaded to provide a nice tight fit. But gravity doesn’t care how tightly this container is packed. If we calculate the weight or mass of the drums at 150 kilograms each and there are four drums per pallet, that totals 600 kilograms. If the drums are double stacked, that’s a total of 1,200 kilograms. When we multiply the mass of the drums by 9.8 meters per second squared, which is the force of gravity, we arrive at the calculated force of 11,760 Newtons. That’s a lot of force. If a ship can roll up to 30-degrees to the side, the g-force exerted by these drums is now directed at the corrugated boxes every time the vessel rolls! In particularly rough seas on a trans-Atlantic voyage, a ship can roll side-to-side as many as 60,000 times. But that’s not all. There are also vertical stresses caused by the pitching of the ship, which can be lifted by large waves. Certain ocean ships can encounter waves up to 40-feet high. Ever been on a fast amusement park ride? In addition to the physical forces caused by gravity, there are also climatic conditions such as moisture and humidity that can cause problems depending on the nature of the freight being transported. 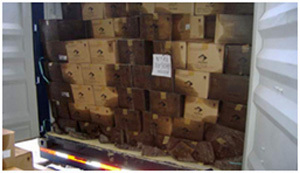 You should take particular care whenever you are packing substances that are adversely affected by moisture. Even if a product is packed in relatively dry air, that product can be subject to high humidity along the way. 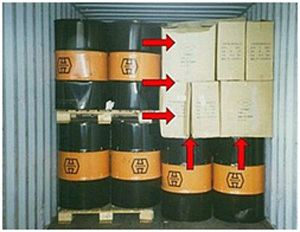 Unless the moist air inside a container has a way of escaping, the product could be damaged if the moist air condenses. Desiccants, which are used to sustain a state of dryness, must be used for products that are susceptible to moisture. In order to avoid cargo damage from moisture in closed CTUs during a long voyage, you should take care that other wet cargo, moisture inherent cargo, or cargo liable to leak are not packed together with cargo susceptible to damage by moisture. Do not use wet timber planks, bracings, pallets or packaging. In certain cases, you may be able to prevent damage to equipment and cargo by condensed water dripping from above by using protective material such as polythene sheeting. However, such sheeting or wrapping may promote mildew and other water damage if the overall moisture content within the CTU is too high. If you are going to rely on desiccants, you should make sure to calculate the necessary absorption capacity. When lumber is used as a packaging material or shipping materials, you may be required to comply with the quarantine regulations of the destination country. That may mean you need to place a phytosanitary certificate or proof that the lumber has been treated in a conspicuous place in the container. The International Plant Protection Convention (IPPC) mark should be burnished on each piece of lumber used. This applies to all pallets and any materials used in blocking and bracing including temporary bulkheads. In the United States, this information can be obtained from the Animal and Plant Health Inspection Service (APHIS), but shippers need to check the destination country’s phytosanitary authority. As you can see, that’s a lot to consider. But it’s really only the start. Shippers must be sure that the containers they use are in good condition and packed correctly. In Part 2 of this series of articles, I’ll take a closer look at the not-so indestructible shipping container. In Part 3, I’ll discuss the additional requirements for packing dangerous goods.